Shakespeare's last will and testament: made 25 March 1616, proved 22 June 1616. 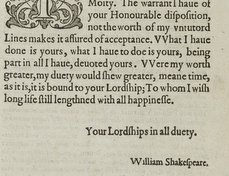 Will of William Shakespeare 25 March 1616. Proved 22 June 1616. Scholars have suggested that the will was drafted in January, then revised and partially redrafted on March 25 to reflect the change in the marital status of his daughter Judith. She married Thomas Quiney just over a month earlier, on February 10. At the top of the first leaf January is crossed out and replaced with March. On the same leaf, a reference to Shakespeare's son-in-law is altered to his daughter, Judith. On the second leaf a section making provisions for Judith "vntill her marriage" is deleted. Thus it is thought that the first leaf was entirely rewritten and then revised, and that the second and third leaves were merely revised. The preamble of the will and the itemization of bequests are very formulaic. Shakespeare left the bulk of his property to his two daughters: Susanna Hall, his first child, and Judith Quiney. He left money and clothes to his sister Joan Hart and her three sons (the name of the third son, Thomas, is left blank), and plate to his grand-daughter Elizabeth Hall, whom he refers to as his niece. The will also makes bequests of his various properties: New Place; the house on Henley Street in which he was born; the tithes purchased in 1605; the Combe property; the cottage near New Place; and the Blackfriars gatehouse in London. His monetary bequests add up to roughly £350. The only specific objects he bequeaths are a large silver gilt bowl to his daughter Judith; a sword to Thomas Combe, the nephew of his friend John; his clothing to his sister Joan; and his second best bed to his wife. Shakespeare left a gift of £10 to the poor of Stratford, as well as bequests to his overseer, Thomas Russell, and his lawyer, Francis Collins. He left 26 shillings and 8 pence each to his theatrical fellows Richard Burbage, John Heminges, and Henry Condell, as well as to Hamnet Sadler, William Reynolds, and Anthony and John Nash, to buy mourning rings. Shakespeare’s bequest of all of his clothing to his sister Joan has been noted as unusual, given that they were men's clothing. The clothing was probably given to her to sell, or intended for her husband, William Hart. As matters passed, however, William Hart died a week before Shakespeare. The wording of his revised bequest to Judith is thought to have protected her as a prospective widow to account for her new marital status. However, Shakespeare also provides his new son-in-law with an incentive--if Quiney accumulated property, Shakespeare would match it. Shakespeare may have been wary of Quiney, who, on the day following the will's date, was fined five shillings by the ecclesiastical court in Stratford-upon-Avon for fornication. Another interlinear insertion, Shakespeare’s bequest to Richard Burbage, John Heminges, and Henry Condell, three of the King’s Men, confirms his association with members of his playing company to the last days of his life. The fact that he calls them “my ffellowes” may suggest that he still considered himself a King’s Man. Shakespeare’s three signatures are all slightly different from one another. Further, the signature on the first leaf is almost entirely worn away. 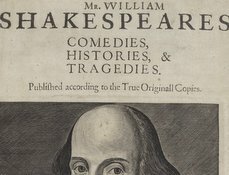 However, if we assume that Shakespeare was ill at the time of signing, and that he was being asked to sign his name at the very bottom of two sheets of paper and halfway down another sheet – not to mention that, if bedridden, he would be writing at an awkward angle from an awkward position – the fact that the signatures are shaky and variously formed is not remarkable. His other three surviving signatures show similar slight inconsistencies, suggesting that (like some other literate men) Shakespeare was given to variation rather than mechanical repetition when signing his name. 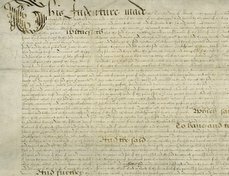 The will is attested at the end by Shakespeare’s lawyer, Francis Collins, as well as four friends: Julius Shawe, John Robinson, Hamnet Sadler, and Robert Whattcote. The executors were his daughter, Susanna Hall, and her husband, John Hall. The overseers were Francis Collins and Thomas Russell (the stepfather of Leonard Digges). The original will shown here, the entry of probate, and the registered copy survive. The probate clause in Latin at the end of the third leaf indicates that John Hall, Shakespeare's son-in-law and co-executor, made an oath to administer the estate on behalf of himself and his wife Susanna, on June 22. Other associated documents, such as an inventory of his goods, do not survive and were presumably lost with other Prerogative Court inventories for this date in the Great Fire of London in 1666. Another copy of the will survives at the Shakespeare Birthplace Trust. The pin-hole marks at the top of each leaf of the will are where the three sheets were formerly attached by pins, a narrow strip of parchment, or string. The will has undergone a series of conservation treatments. According to a 1913 report of the Royal Commision on Public Records, by the 1850s the document had suffered handling damage and was repaired with transparent paper, possibly pelure d’oignon. Then each leaf was set between two sheets of glass in separate locked oaken frames, which were stored in a locked oaken box in the strong room at Somerset House. At the time of the 1913 report, visitors were permitted to view Shakespeare's will and Lord Nelson's will in the strong room for "the usual charge of one shilling." At some point after 1913, the will was repaired again and lined with silk. From 1996-99, the silk lining and old repairs were removed, and small tears on the edges were fixed. All three leaves were lined with Greenwich repair paper and wheat starch adhesive. They were encapsulated and sewn into a fully bound, reverse calf, parchment binding. The binding was stored in a green buckram slipcase with gold tooling. In 1999, the document, binding, and slipcase were stored in a grey folding boxboard box. In 2015-16, it has undergone further conservation: the lining has been removed and multi-spectral imaging has taken place. The original copy of the will was first noted by George Vertue in 1737 (Schoenbaum, p. 242, which cites British Library, MS Portland Loan 29/246, p. 19) and first printed in the third edition of Lewis Theobald's Works of Shakespeare (1752). It was kept in the Prerogative Office, first at Doctors' Commons, and then, when the building was torn down in 1861, at the new Prerogative Office at Somerset House, until being transferred in 1962 to the Public Records Office on Chancery Lane. Since 2003 it has been maintained by the successor to the Public Records Office, The National Archives in Kew. To have and to hold all & singular the said premises with their appurtenances unto the said Susanna Hall for and during the term of her natural life and after her decease to the first son of her body lawfully issuing, and to the heirs males of the body of the said first son lawfully issuing and for default of such issue to the second son of her body lawfully issuing and to the heirs males of the body of the said second son lawfully issuing and for default of such heirs to the third son of the body of the said Susanna lawfully issuing and of the heirs males of the body of the said third son lawfully issuing. And for default of such issue the same so to be and remain to the forth, fifth, sixth, and seventh sons of her body lawfully issuing, one after another, and to the heirs males of the bodies of the said forth, fifth, sixth, and seventh sons lawfully issuing in such manner as it is before limited to be and remain to the first, second and third sons of her body and to their heirs males. And for default of such issue the said premises to be and remain to my said Niece Hall and the heirs males of her body lawfully issuing for def[ault of]...[damaged]...such iss[u]e to my daughter Judith & the heirs males of her body lawfully issuing. And for default of such issue to the right heirs of me the said William Shakespeare forever. 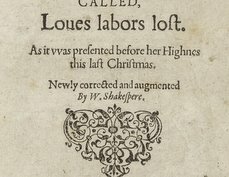 To learn more, read Alan H. Nelson's essays on wills and the use of "Fellow" as a title in Shakespeare's England. Samuel Schoenbaum, William Shakespeare: a Documentary Life. (Oxford: Clarendon Press, 1975).